This year, in an effort to up my cooking game, I plunged into the Culinary Techniques program at the International Culinary Center. After some introductory lessons in knife skills and stocks, it was time for Fish Week. Some students were noticeably squeamish, wrinkling their noses and reaching for gloves. I rolled up my sleeves as Chef Ray began demonstrating how to fillet a fish. In just a few deft motions, he slit the striped bass along its spine and gently removed a fillet. “Use long, smooth strokes guys. Don’t saw at it, and make sure you bend your knife so that it scrapes against the bones,” he instructed. You could hear his blade rasping against the spine. After both fillets were removed, Chef Ray slid his knife between the meat and skin, and gently stripped it away. What remained was a perfect slab of fish, pink and well shaped. It looked simple enough. “Remember to always check the freshness of the fish before you start!” said Chef Ray. “Clear eyes, taut stomach, bright skin, gills full of blood, no fishy or off smells.” I blotted my fish with a clean towel to dry it, and began snipping off the fins with kitchen shears. “Watch out for the spikes in those dorsal fins, they can really hurt!” warned Chef Ray. With my fish knife (thin, flexible and very sharp), I began slicing against the spine. Wait, is that bone or meat? Why is the skin not slipping off? I glanced across at my partner’s fish; he’d already finished his fillets and was cleaning his carcass of entrails. “Five more minutes!” said Chef Ray. I hurried to remove the skin and yank the remaining pin bones out with pliers. Two fillets sat on the cutting board, mangled by cuts and disappointment. The process for filleting flatfish is a little different than for round fish. Flatfish have four fillets, not two, and swim horizontally, with their bellies parallel to the seafloor. You begin by slitting down the center of the fish, following the spine, then take out two fillets from the top of the fish, and two from the underside of the fish. 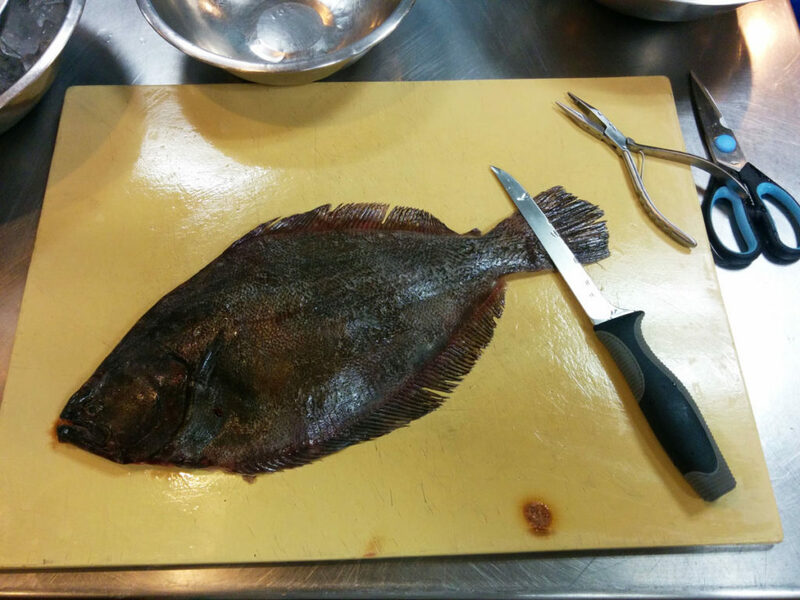 It’s much easier to fillet a flatfish and the fins are floppy, so you can’t stab yourself inadvertently. After tackling my flounder, I was left with four ragged but mostly respectable fillets, and a carcass which would be used for fish stock. 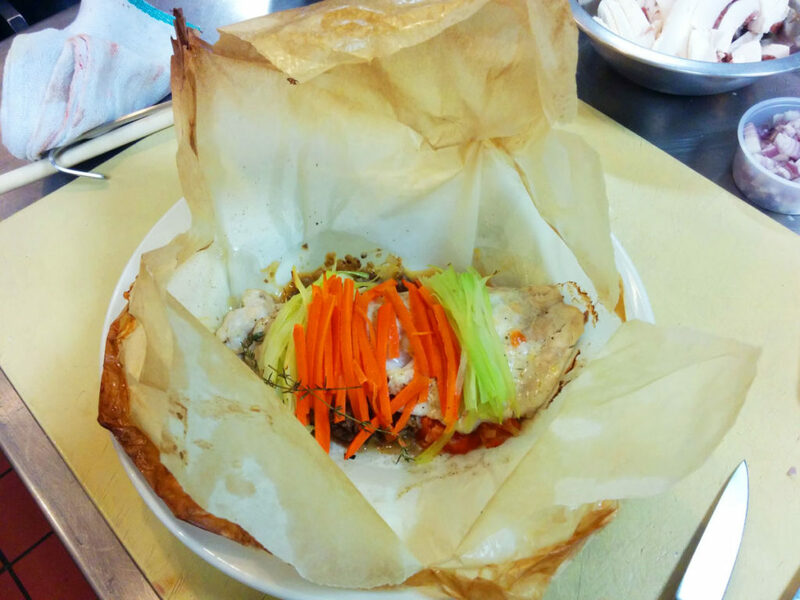 With the stock simmering away, we started on the next task: poisson en papillote, or fish baked in parchment paper. 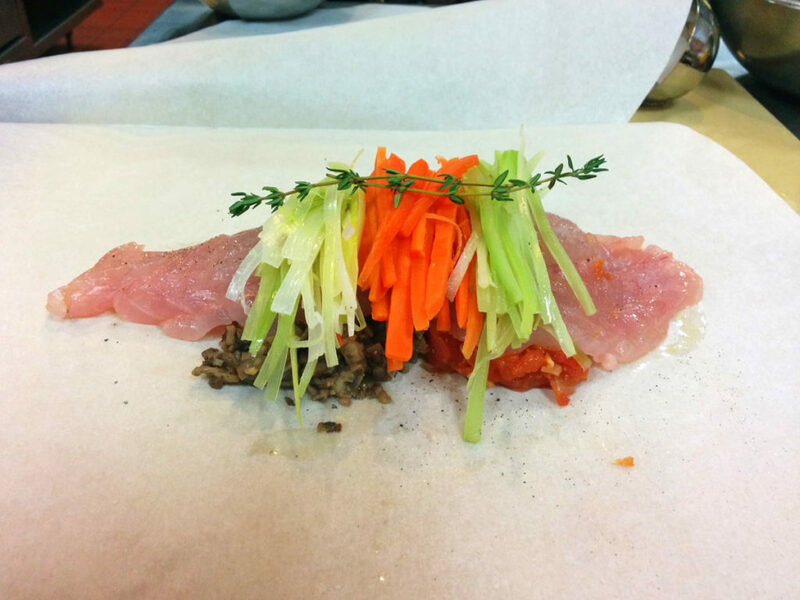 This requires cutting a heart shape out of parchment paper and putting fish inside, along with a splash of liquid and any other garnishes. 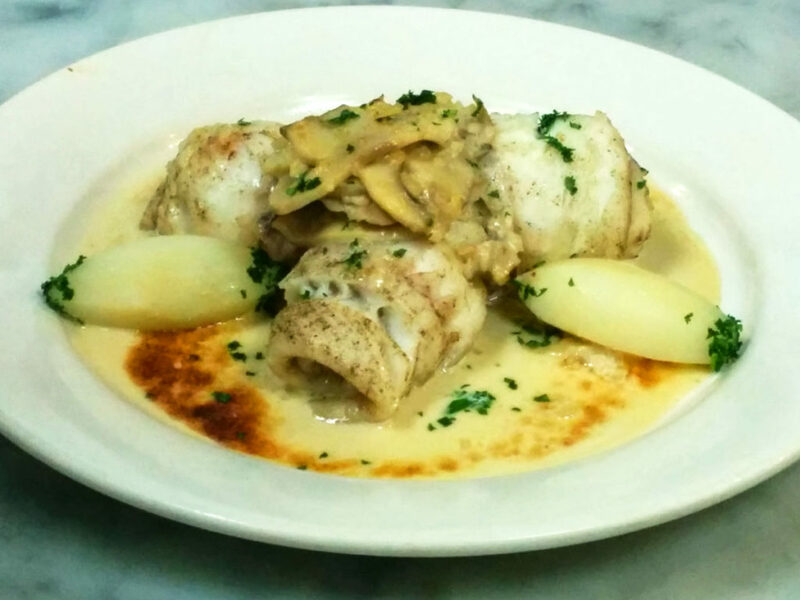 We placed the striped bass fillet on a bed of mushrooms and chunky tomato sauce, then carefully arranged leek, carrots and celery on top, followed by a drizzle of white wine and a sprig of thyme. Brushing beaten egg whites and crimping along the edges will seal the packet, which goes into the oven to bake. This employs three cooking methods at once: baking, braising and steaming. For the flounder fillets, we rolled each one, then shallow poached them over a bed of shallots and mushrooms, partially immersed in the fish stock. Once the fish was cooked, it was removed from the pan so that the sauce could keep reducing. With the additions of reduced cream, whipped cream (yes, two rounds of cream) and a little lemon juice, the sauce was addictively good, an epic rock anthem for the power of ocean flavors and cream. I couldn’t put down my spoon. For that, I would happily fillet dozens of fish.